Our experienced attorneys know how to comb through the facts in a nursing home neglect case to help support a client's claim. We fight aggressively to see that our clients get the settlement they deserve. Call 1-800-898-HAYS right away. When the services and care necessary to maintain a nursing home resident's health, comfort and safety are not provided, there is almost certainly negligence present. It may be an intentional refusal to provide the service or a failure to do so because of inadequate staffing or lack of a plan to prevent nursing home injuries. 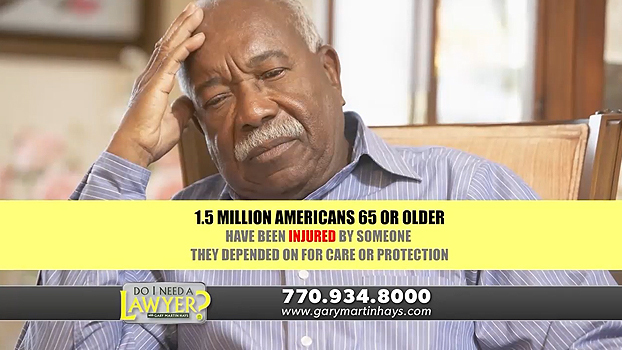 In this segment of "Do I Need a Lawyer," Gary Martin Hays answers a question from one of our viewers who fears her mom was being neglected at a nursing home. Examples include failure to prevent dehydration or malnutrition, untreated bed sores or otherwise ignoring a bedridden resident, poor personal hygiene, and any unsanitary living conditions. Don't stand for it! Keep an eye on signs of neglect, which includes sepsis, a potentially deadly condition arising out of an infection. Other indicators include urinary tract infection, kidney failure and unexplained bruises and cuts. When you seek legal help, your lawyer will start by listening to you at no charge. If you have a case, we will begin an investigation and consider a potential neglect lawsuit. We have experience investigating all types of complex nursing home neglect cases throughout Georgia. Our attorneys are well-versed in state and federal laws governing the treatment of people in nursing home. The Federal Nursing Home Reform Act provides standards of care and includes the rights of patients. While federal laws are designed to protect the public, neglect continues to be a problem. That's why you need an aggressive lawyer on your side if your loved one was neglected at a facility in Georgia.